The What: Multicom has introduced the MUL-OTDR-200 and MUL-OTDR-300 handheld Optical Time Domain Reflectometers, the newest generation of intelligent optical-fiber test equipment. They are designed for use in the construction, maintenance, measurement, and emergency repair of optical-fiber communication systems networks as well as the development, manufacturing, and measurement of optical fibers and optical cables. 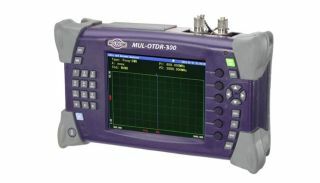 The What Else: The OTDR is able to identify the connecting fault and disconnecting locations of optical fibers and optical cables, improving the accuracy of examining exactly where any disconnections are occurring in real time. Specifically able to measure the length of the cable, and the distance between any two points in the curves of optical fiber, it is also able to indicate the power level of intelligent batteries. This means that it contains a power indicator that will shut off automatically when the device reaches a certain low-level of voltage, all the while being small and light enough to be used as a handheld device.